I suspect I enjoy menu browsing outside of restaurants more than window shopping at department stores and clothing boutiques. I enjoy a decent deal off cute heels or a dress. However, I love a good meal. A tasty bite softens the blow of a bad day. Warm soup chases away the chill from a summer storm. A fine glass of wine makes my world a better place, on good and bad days. 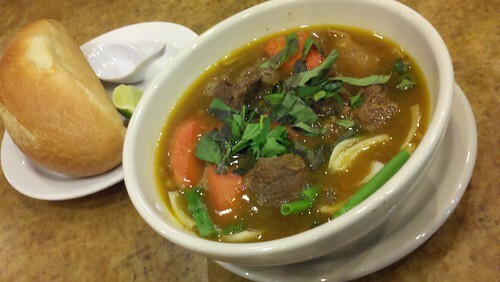 On cold days, I drop by Com Tam Thanh in Newark for their beef stew with a French baguette. It’s a rich broth, with hints of butter and fortified with carrots and hearty vegetables. I know Vietnamese cuisine is all about the pho. However, this stew is also amazing. About a decade ago, I always ordered steamed mussels in white wine as my comfort dish. That was my favorite dish at Becketts in Berkeley. Even though it was on the appetizer menu, the mussels filled me up for dinner. When I was dating my hubby, we liked hitting Becketts after work. I remember one time we ran out of bread at the table. I wanted more of that tasty white wine broth. So, I used a mussel shell as a spoon and worked on the broth. At the end of the meal, I noticed there was a spoon hidden under the mussels bowl. I asked future hubby if he knew about the spoon. “Yes. I thought you liked spooning up the broth that way,” he said. (Since it was about ten years ago, I’m paraphrasing.) I guess I looked cute sipping the broth from my makeshift mussel spoon, but come on! Still, it’s a funny misunderstanding. On days when I’m craving crispy pork skin, I drop by Tipanan for the sisig. The plate is still sizzling hot by the time it makes it to my table. After our Memorial Holiday weekend in Half Moon Bay, I can’t stop thinking about this amazing lobster roll from Sam’s Chowder House. 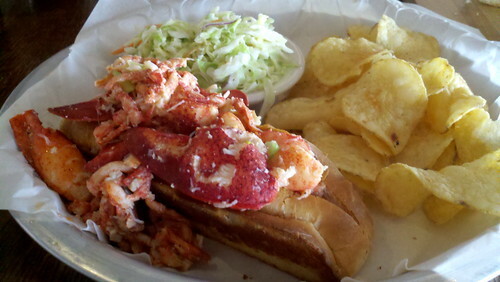 The Today Show raved about the lobster roll and I can see why. The fresh lobster pieces are tossed lightly in butter and served over bread. Perfect. What do you consider comfort food? The bar inside Nijo Castle in Newark serves up tasty sushi and cocktails. On the weekends, crooners show off their ballad skills for Karaoke night. On some nights, you can catch a bartender showing off his flare. Facebook peeps, check out my blog to watch the video. Tug of the leash. Groan from the dog. 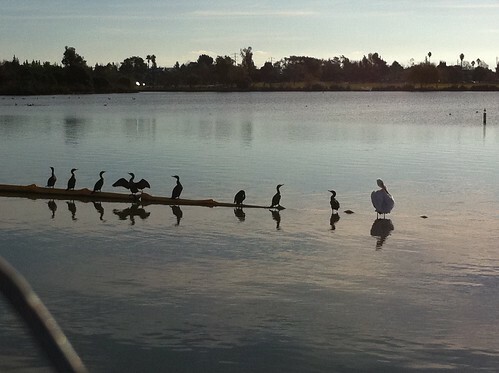 Daisy always wants to run up to these fine-feathered visitors at Lake Elizabeth. I try to point out to her that her floppy ears won’t help her fly across the water. Plus, she’s not a fan of the water. According to her dog camps in Kansas and Sacramento, she won’t dive into a wading pool. I try to reason with her but Daisy keeps tugging at her leash. 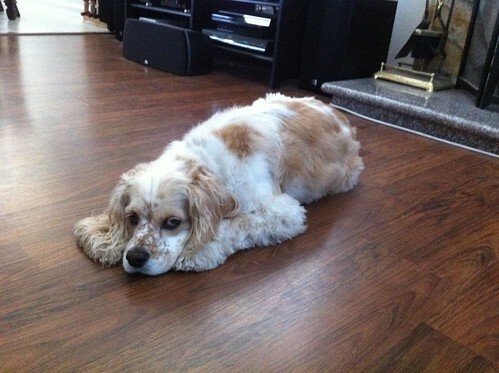 Poor dog. The lake is also my favorite place to clear my head and take a break from my new life as the Newark Patch editor. To other people – I am the Patch Girl. I suppose “Patch Girl” sums up my bachelor’s degree from Cal, my master’s degree from Northwestern, five years of TV news producing experience in Sacramento and Kansas, three years of tech support experience at the Haas School of Business, two weeks of journalism lecture experience at St. Petersburg State University in Russia and more than a decade of blogging and social media experience. Yeah, I had Friendster and Six Degrees accounts before MySpace made a blip. During my broadcast news days, some people had no idea what I did for a living when I introduced myself as a TV news producer. I think my parents couldn’t understand why I blew so much money of my education in order to accept a position on the other side of the camera. I think it made more sense to them when they saw me operating in the control booth and calling the shots for a morning news show. Now – when I introduce myself as the editor of Newark Patch, it’s quite nice to that light of recognition. Better yet, it’s nice to hear folks talk about the stories on the site. The best part, it’s nice to see them smile when they chat about our community news website. This is all true for a small portion of Newark. We’re still introducing the site to more people. However, it feels like we’re making progress. 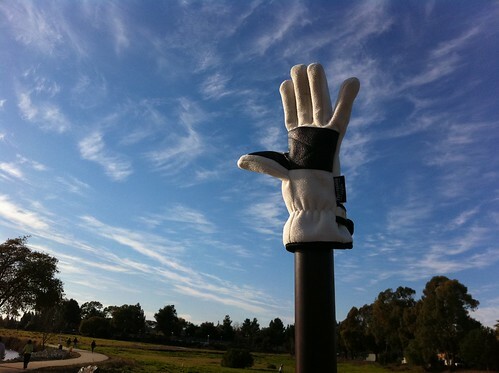 So – can I get a High-Five? Here’s a shot of one of my working lunches at Tipanan in Newark. I go over email, pork adobo and sisig. Yum! Yes, I had leftovers. Outside of my virtual newsroom, I am also happy to spend more time with our Bay Area friends. Scott and Catalina were the first to explore Fremont and Newark. Under cloudy skies, the boys sipped beer and adjusted the telescope that Scott brought over to our little house. Everyone – just nod and agree. 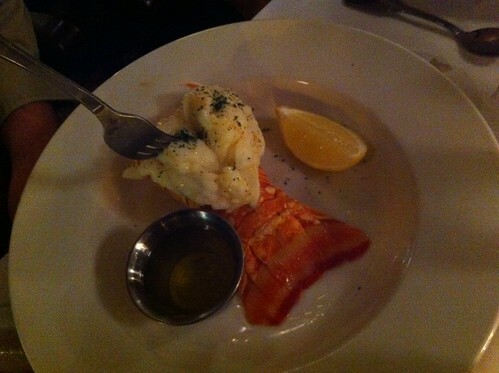 We also enjoyed steaks and lobster at Sinodino in Newark. It’s an adorable steakhouse inside a white farmhouse. Newark peeps tell me that’s what they used to call it, 30 years ago…the farmhouse. 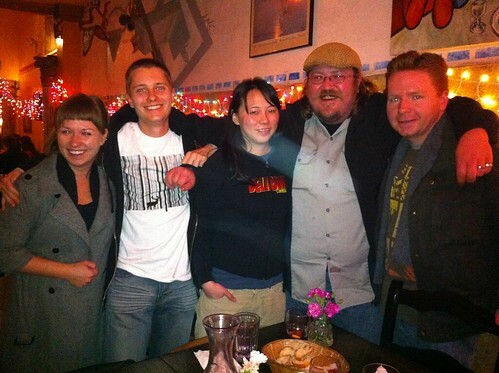 On the first day of 2011 – we did tapas at Picaros in San Francisco. Tom’s sister, Hannia, needed to charge her phone. So we plugged her cellphone into the Christmas lights. It worked. 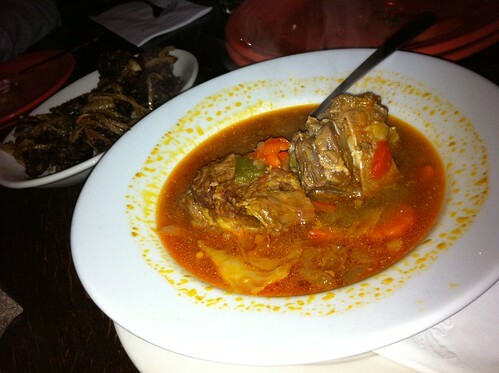 And it was pleasure to work on this super meaty oxtail soup. The meat fell off the bones and every slurp was heaven with that meat broth, infused with bones, vegetables and herbs. And when Mark has time, he introduces me to food spots in Palo Alto. 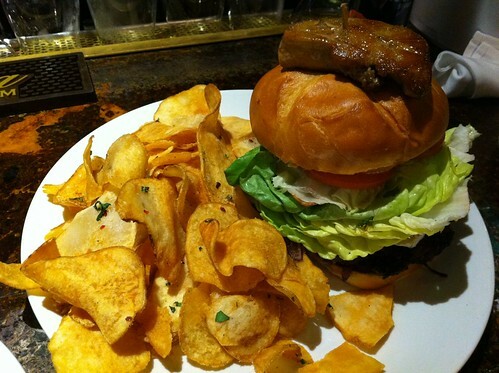 This is the $40 Foie Gras Burger. It was big enough to split between two people. Oh yah, I loved it! Today – I need to run off all the damn calories gained from our eating adventures. Yes Daisy, more tugging on your leash. My first two weeks on the job and on the ground in Newark have been intense. I suspect that’s an understatement given the expectations and accelerated timeline for my site launch. In fact, I haven’t had time to move. We’re sleeping on an air mattress at our new house, Daisy is at camp and this morning, Newark Patch headquarters is located on our kitchen counter. Bring it on. Plus – I’m getting to know my neighborhood stores. I’ll have more on a sweet deal for these birds in a moment. I’m also meeting some wonderful people who truly care about this community. They’re volunteering at Newark food banks to make sure all families have a decent meal for Thanksgiving. Donations are coming in – but many places need more food to set the table for their holiday feasts next week. Over at the Viola Blythe Center, volunteers say they are feeding nearly 220 families for the holidays. On Thanksgiving, I’m heading home for my family’s amazing cooking. We’re pairing white rice with roasted turkey. I may try to sneak some bacon on top of the bird as it’s getting cozy in the oven. Beef or chicken adobo, lumpia and other Filipino treats share the table with cranberry sauce, bread and Thanksgiving trimmings. 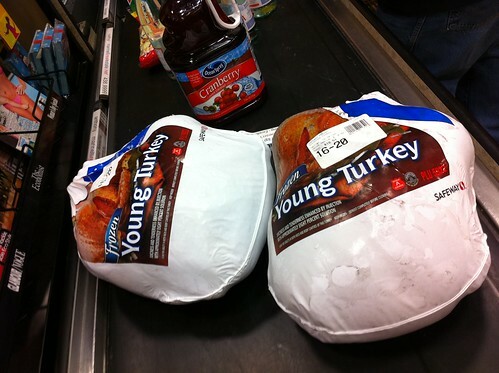 Since I had my holiday meal covered, I figured I could afford to pick up a turkey for the food banks. Thanks to Safeway in Newark, I found a great deal on birds. If you spend $20 on groceries, each 16-20 lb. turkey costs $8.77. I picked up some magazines, stamps and two heavy birds. Thirty minutes later, I dropped off the turkeys at a food pantry. I’ve been blessed with a job and this is only a small way I can pay it forward.